Yang Mi has just turned 32 today, Sep 12. The thing about gossips is that it doesn't choose a time and place and the day became a fuss about who greeted and didn't greet. I can tell you who greeted at 12mn sharp, it's Dilireba, Vin Zhang and the rest of the Jaywalk Studio family. Zhu Xudan greeted at 12:05, and that's already late by their standards. However, the birthday celebrant was actually all the way on the other side of the world at the time. 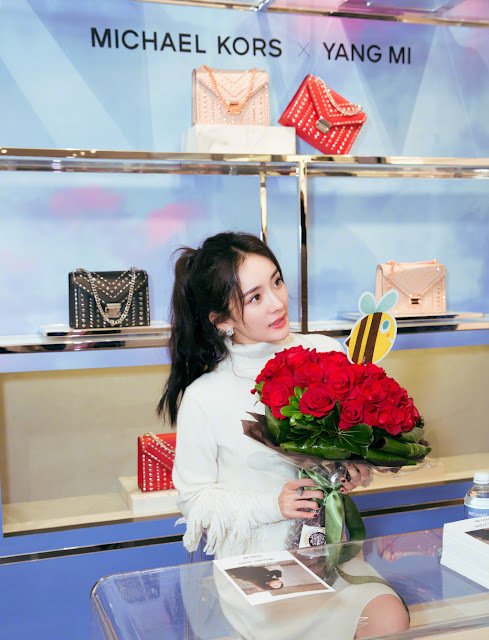 Being quite the social butterfly (or is worker bee more like it), Yang Mi who spent her birthday in New York last year and was seated next to Mark Chao at a Michael Kors fashion show returns to the city for New York Fashion Week. As the Michael Kors global endorser, she just held a fan sign event at Rockefeller's Center and she's off to attend the show. It sounds like a fabulous way to celebrate. Happy birthday! I like Yang Mi work ethics. One thing I like about most of chinese top stars is that they still take on new projects whether movies or dramas. They are already loaded with endorsements deal but still act. I have respect for actors who still take on different roles for their careers. K-ent top stars take too long of a hiatus and depend on cfs for as long as they can from one drama or movie. I think its because the market in China is alot bigger and more competitive, so actors have to keep working to not get replaced and forgotten. Also, they produce 2x more drama per year than Korea does so they have more opportunities. But in terms of quality I find Korean dramas to be slightly higher. Most C-dramas have really weak scripts. Yang Mi and her husband have such an open you live your life and I’ll live mine relationship. It’s so weird. I wonder if she regrets getting knocked up because she lost out on opportunities. It's not weird - all couples decide how they want their relationships to be. They don't have to answer to or use someone else's standard if it's working for them. Why would she regret having her little girl? Being a working 'mother' is not easy and she gets judge for it both ways (not spending enough time with family vs. working hard for family) and literally can't win. I think if she hadn't got knocked up they would never have married and would have broken up eventually. I believe the rumours that this marriage is an arrangement at this point where they stay together for business and finance reasons and for the sake of the daughter but do whatever on the side as long as they are discreet. Cool if that's what works for them and it wouldn't be the first marriage of this type but it's unfair on their daughter when her mother is in another country or even another continent most of the time. Not even sure how present Hawick is as it seems like his parents are mainly in charge of raising the little girl. The truth is we really don't know anything about her private life, especially how her daughter feels or what is the state of the marriage. People can chose to believe rumors but rumors aren't facts. Just because she doesn't post 100,000 photos or is seen with her husband and daughter - it doesn't automatically mean their relationship is bad. She can be a hard working parent and doing what is best for her daughter by having them live with Hawick's parents but it doesn't mean that she isn't involved in her daughter's live. What celebrity wants their child to live the life of a celebrity without privacy? I find it weird because they would rather stay together than divorce to protect their celebrity image. Hawick’s parents have shown their frustration over this mess many times. It’s unfortunate, so learn from it. Don’t get knocked up and get married just because. I dont think shed ever lose any opportunity at all. But I do wonder how rich people feel about growing up without their real parents togrther with them at a minimum of 70% of the time during their childhood, BUT, however, they are rich and have lots of money though. Any studies about that topic before? If anything she would regret for trusting and loving him. She got married to him when she was at her peak and he was and is still B-list star. But she was really in love and happy before even she lost some of her popularity and endorsements due to married women and mother image. However, she has basically mostly on her own after his cheating scandal. Do people not realize it? She loves acting and want to act too. It's not just about making money.